Chambre d'Hôte de Paris : Your B&B in the charming historic village on one of the mythical hills of Paris, Paris XIII district! We are delighted you are planning a trip to Paris and look forward to arrange your stay in our private home. You will find that staying as a welcome guest in a private house is a great way to experience Paris. 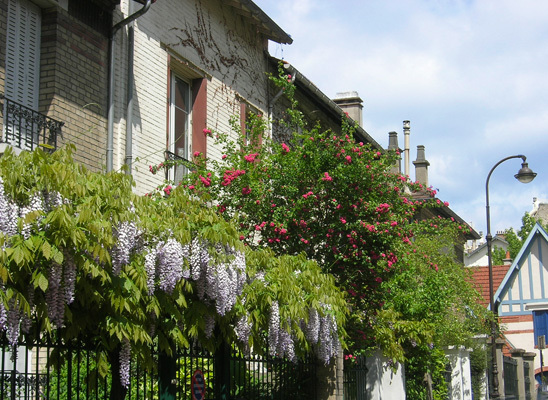 Our Paris Bed & Breakfast, located on the sides of a preserved village, opens on a quiet and flowered no through road. Three guest bedrooms can accomodate up to eight persons in the charming historic village on one of the mythical hills of Paris (named Buttes aux Cailles – Paris XIII district). Our Paris Bed & Breakfast is also near the Gobelins district in the south of Paris, just minutes from the Pantheon and from the very nice Montsouris park. This is the perfect B&B for business people and visitors seeking charm and quality.